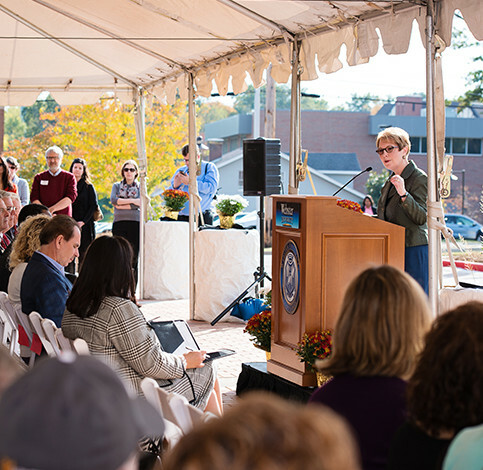 "From an educational standpoint, these spaces have been used by our biological science department and the sustainability committee to teach our community about LEED and other sustainable building practices."  Locally-harvested stone, and native and adaptive landscape look natural without feeling overgrown. 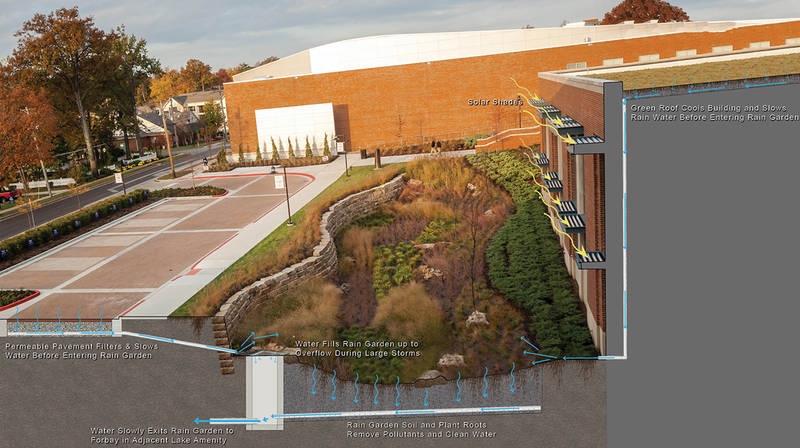 Rain water filters through the rain garden and adjacent green roof where pollutants are removed and water cleaned before exiting the system. 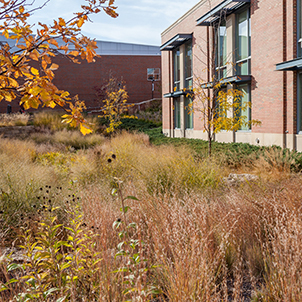 The rain garden and plaza were designed for the public realm, and the interior courtyard serves as a private space for students and faculty. 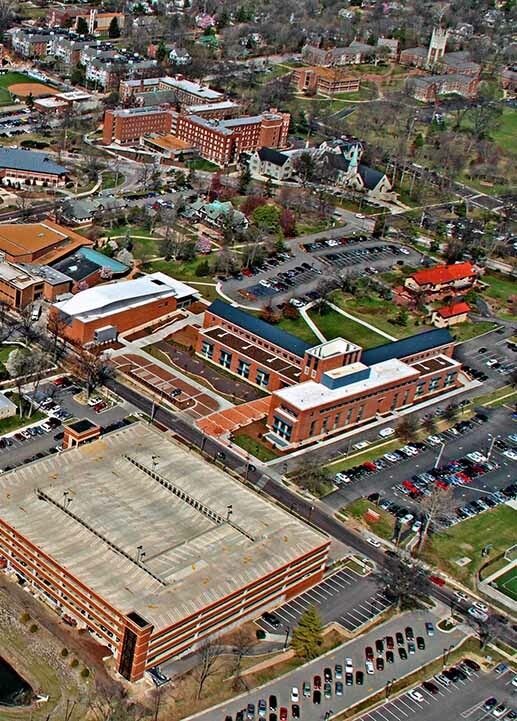 The East Academic Building and its site links the historic campus with the future sustainable direction of the university. The blurred lines of interior and exterior spaces create and warm and inviting juxtaposition within the quadrangle. It stands to serve as a catalyst for all future development, proof that sustainability transcends boundaries. 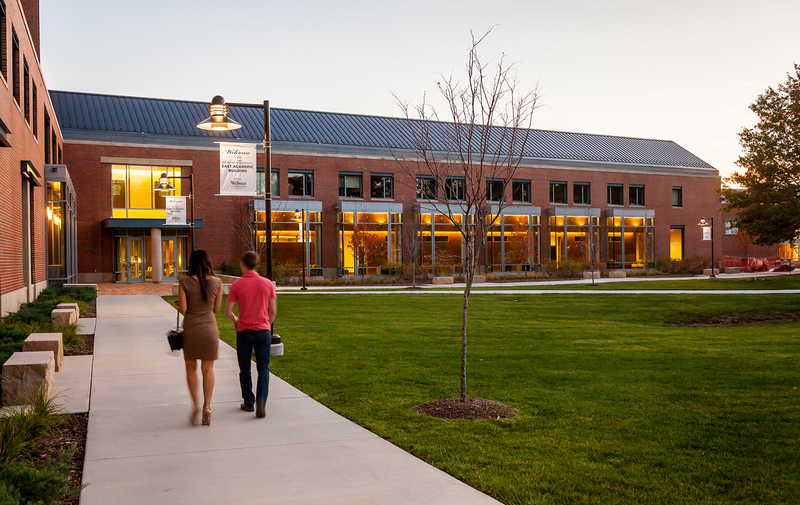 Webster University’s East Academic Building, the first new classroom building constructed at the institution since 1984, is a testament to the university’s commitment to environmental stewardship. 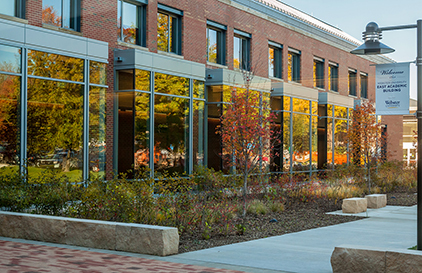 Dedicated to the university’s school of business, the academic building and its 3.5 acre site set a new precedent and were designed using sustainable best practices. 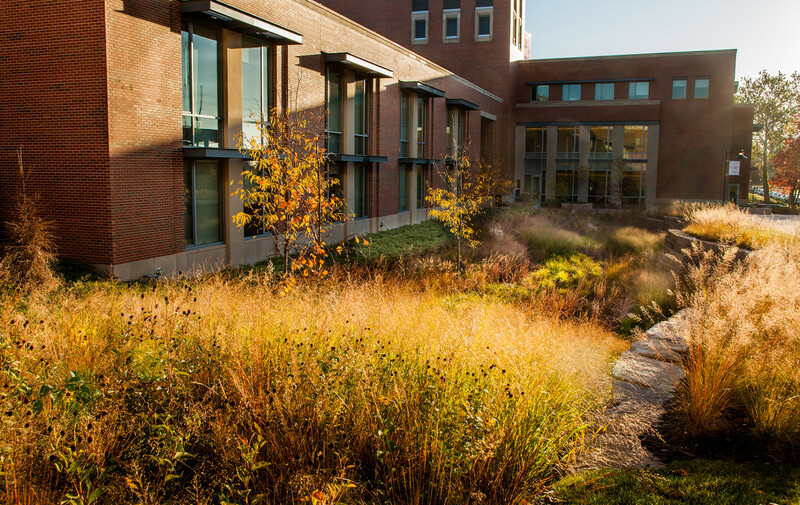 Rain gardens, permeable paving, native materials and the building’s two extensive green roofs advance the brand and identity of the university and establish a new forward-thinking approach to future development on the campus. 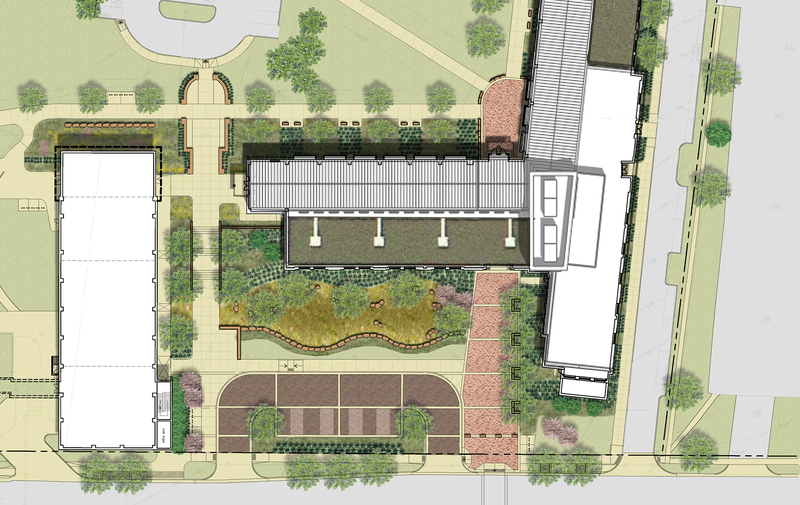 While the rain garden and front entry plaza were designed for the public realm, the interior courtyard serves as the building’s more private space for students and faculty. 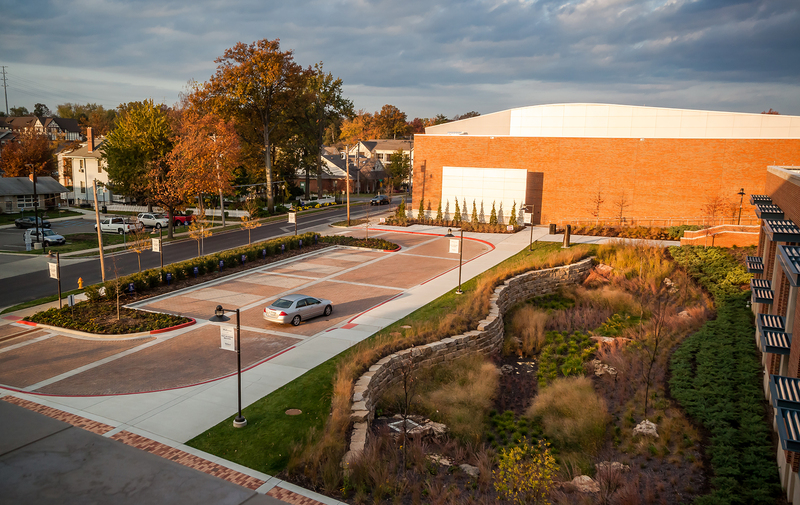 The simple lines and open air feeling of the space reflect more of the traditional quality at Webster University. 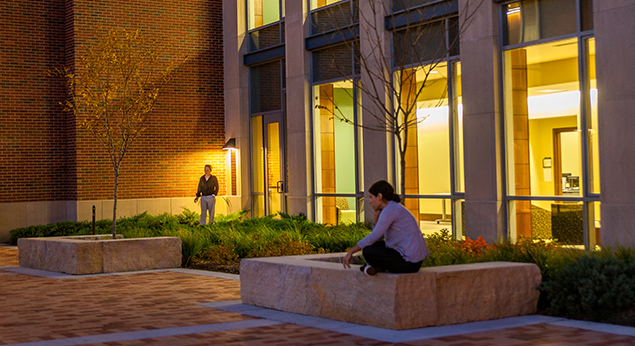 Both facades of the building project views onto the courtyard, inviting students and faculty to the space. "We designed the space for current needs, but planned for future development that would eventually enclose the quadrangle, forming a more private, intimate space."